The Catholic International Education Office responsible for overseeing Catholic schools globally has called for all its schools to be ‘non-discriminatory’ and ‘open to all’, contradicting the position of the Catholic Education Service for England and Wales, lobbying for more powers to religiously discriminate in their school admissions. In an official paper circulated at the Council of Europe recently, the Catholic International Education Office (OIEC) – the umbrella body for over 100 national catholic education organisations, including the CES – stated that a ‘Catholic school is an inclusive school, founded in intercultural and inter-religious dialogue, a non-discriminatory school, open to all, especially the poorest’. The paper goes on to conclude that a ‘Catholic school is anything but a communitarian school. It is open to all. In many European, American, Arab, African or Asian countries, the Catholic school welcomes mainly, or even exclusively, Muslim pupils, Buddhists, animists, or pupils of other religions, even those without religion. It must constantly promote intercultural and inter-religious dialogue’. In September, the UK Government announced that it will no longer require religious free schools in England to leave at least half of their places open to local children regardless of religion or belief, proposing instead to allow all new and existing religious free schools to select 100% of their places with reference to religion. The move was largely provoked by claims from the CES, subsequently echoed by the Prime Minister, that the so-called 50% cap on religious selection contravenes ‘canon law’. In protest to the cap, the CES has not supported the opening of free schools since it was introduced. However, the OIEC has now, effectively, condemned this approach. Its remarks add further weight to the growing recognition that the CES’s position is not only at odds with the views of most Catholics in England and around the world, but also represents a political tactic rather than a genuine religious objection. Earlier this month, a poll conducted by Populus found that 63% of Catholics are opposed to any religious selection in state school admissions, and a survey carried out by the BHA in September found that the vast majority of Catholic private schools in England do not select all of their places on religious grounds, with many saying they do not religiously select at all. Around the world, a recent OECD survey identified Ireland, Israel, and Estonia as allowing their state schools to religiously select, while many schools in Scotland have open admissions. 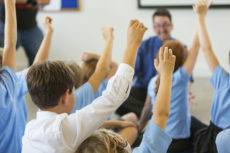 ‘It is becoming increasingly unclear what the motivation of the Catholic Education Service is in lobbying for more freedom to discriminate against and segregate children on the basis of religion,’ said BHA Education Campaigner Jay Harman. ‘Its position is not supported by the majority of Catholics, it is evidently not supported by canon law, and now we see that it is not supported by its parent organisation either. In fact, even the director of the CES has expressed concern over the consequences of moving back to single-faith schools. For further comment or information please contact BHA Education Campaigner Jay Harman on jay@humanism.org.uk or 0207 324 3078. Read the OIEC’s paper on Catholic schools The OIEC is the international NGO that acts as an umbrella body for national Catholic education organisations. It has official recognition from the Catholic Church for this role as an international association for the faithful, and as such is listed in the Directory of International Associations of the Faithful, published by the Dicastery for the Laity, Family and Life. Its UK member is the Catholic Education Service, the body appointed by the Catholic bishops of England and Wales to support Catholic education.